Wake up bright and early on the first day of the Summit, well ok it wasn’t super bright and early but early enough to try to make breakfast and still catch keynote. My wonderful roommate, Julie Smith (blog|twitter),and I head over to try to grab a quick bite to eat before the keynote starts. We had about 10 minutes but they shut down breakfast and the doors were locked…or so we thought. We hadn’t gotten the lay of the land yet and assumed food was in the same place as last year, it wasn’t. Doh moment #1. Very much bummed about missing a meal we head to the keynote. There were a few technical nuggets such as the next step in the road with in-memory solution Hekaton and the SQL 2012 sp1 update release. The bright spot speaker wise was Amir Netz. He did a good job again this year with entertaining demos and upbeat, enjoyable style. Later there was the mention of “having a BI moment” which a Twitter did catch and run with as it very well should have. After the keynote I was anxious to wander around and get my bearings on where things were laid out so I roamed for the first session slot. Found the vendor area and the hub for the rest of the week, the Community Zone. I then helped pass out maps for the chapter lunch which was entertaining. Folks must have thought I was trying to sell them something as I had trouble with people taking free maps. I only had to strong arm a few folks and after that went in to help represent my IndyPASS chapter. I had some really great conversation with folks from my local area. Many at the table were Indy locals who don’t come to meetings so was a good chance to run new ideas to pull new members by a perfect target audience. Thank you guys for your feedback at my table that day! I also got a chance to encourage some of them there to start speaking technically after he mentioned a really exciting project one of them was doing implementing AlwaysOn. Then I head over to catch a Lightning Talk session. This one was done by Brent Ozar (blog|twitter), Amy Lewis (twitter), Mark Broadbent (blog|twitter), Rob Volk (blog|twitter), Robert Davis (blog|twitter). 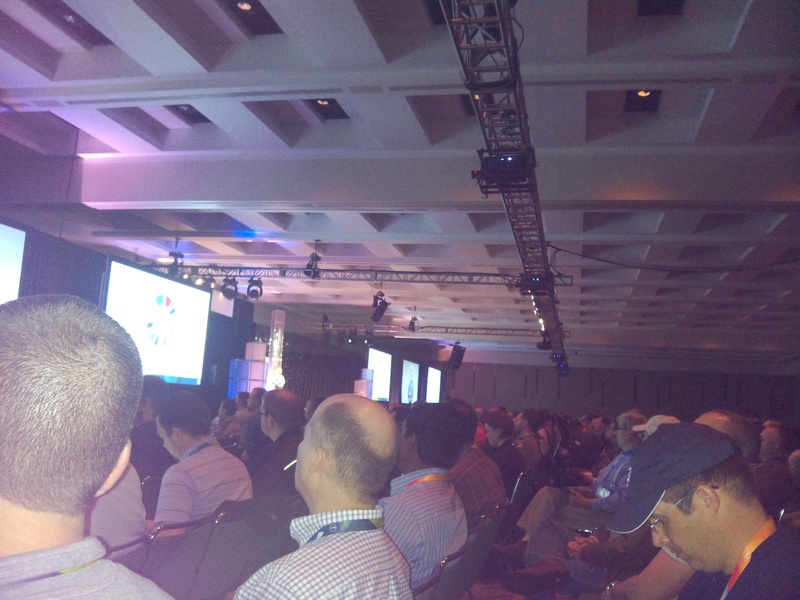 Was a good thing I got there when I did…it was PACKED! 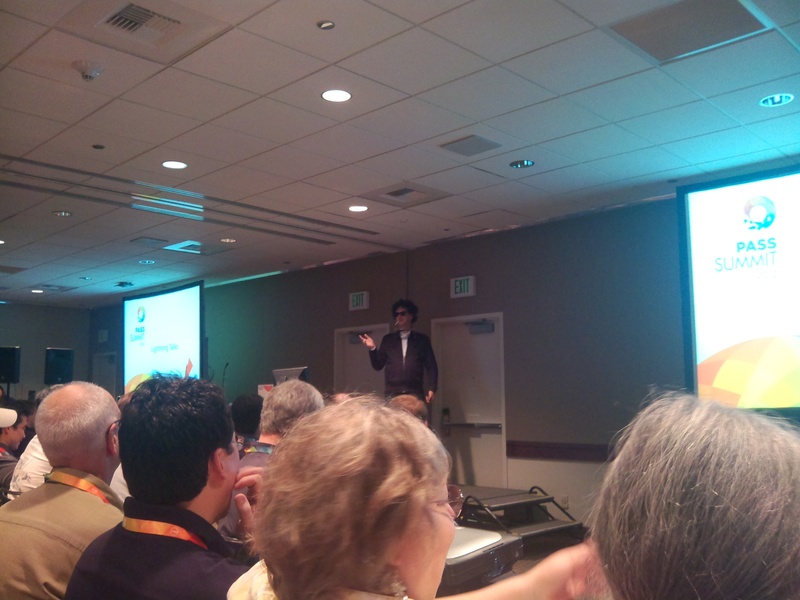 Dear PASS folks in charge of room selection, please put Lightning talks in a larger room next year. I always try to go to those as they just aren’t the same on the DVD and better to see live. Can’t see Brent Ozar dressed up like Bob Dylan on the DVD for sure. I wonder how many folks are going to be super confused when watching that one on DVD now that I think about it? “Who is this quasi southern accent raspy voice dude? Where is Brent O?” Everyone did a good job in that session. Mark Broadbent had some technical difficulties with the projectors but he handled it well and it kind of added to the fun of it. From there I went to the Steve Jones (blog|twitter) and Andy Warren (blog|twitter) session on “The Mentoring Experiment”. I love the mentoring aspect of my job so was intrigued by the topic. 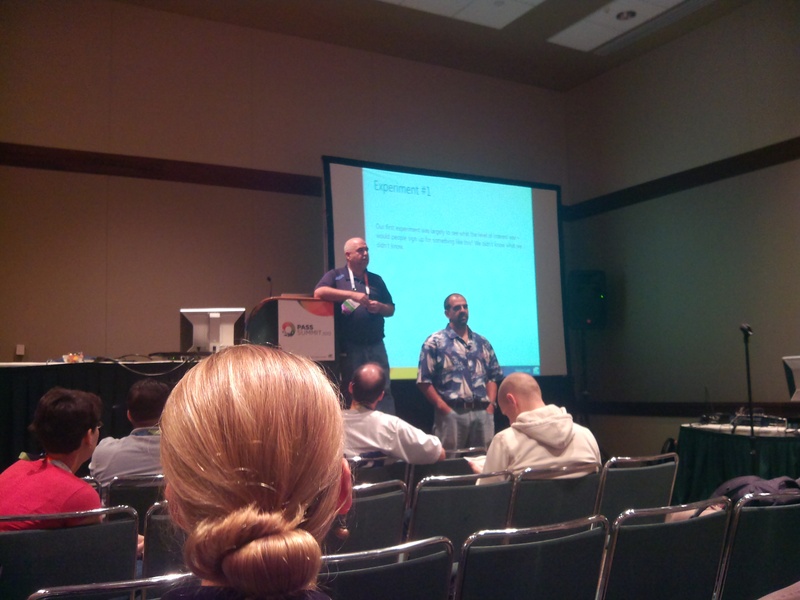 Very interesting session on their experiences with the mentoring matchup program they started for SQL professionals. A lot of tough hurdles in the process, such as match up process being handled manually by matching or random. I gave my opinion that I don’t feel it really matters in that the match ups could be totally random. I think mentoring is kind of like the friendship process in general. I have varying degrees of friends and that process is a matter of chemistry that I don’t know could be formulated or worked out without interaction with the mentor/mentee. I think if 2 people are paired up in a situation where folks want to be a part of the process, they will themselves make it as much a success as the relationship/chemistry will allow. I always feel that there is something to learn from everyone and their experiences so no matter what good will come of the match. Great job Andy/Steve! That is really a great thing you guys are doing. Last session of the day I catch Jen Stirrup’s (blog|twitter) session on Mobile Business Intelligence Now. 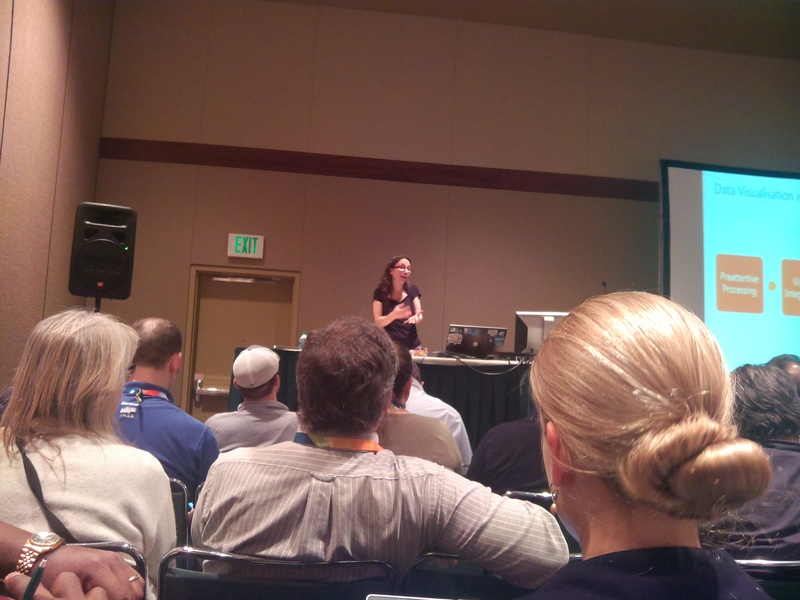 I had never seen a session from Jen in person so was very excited to catch her. I know she probably gets tired of folks talking about her accent but I just can’t help it. SQL Server Reporting Services just never sounded so lovely as it does from her! Very interesting information on how the eyes perceive information and using that to make your reports more clean/impactful. Also had a lot of information on considerations for mobile screens. Very good job Jen! From there head for a bit to the Exhibitor reception for just a little bit. Ran into a lot of folks and chatted up anyone who didn’t run fast enough. They only had appetizers there so was necessary to move on to go get more sustenance. Went over with Julie and Rob and joined in with Mark Broadbent’s group for dinner at the Tap House. After carbo-loading on some crab mac n cheese we head over to Pragmatic Works karaoke party for a bit. It was too crowded for my taste so I bailed to find a different scene. Later I find out there was a roof top area that would have been more up my alley but didn’t hear about it until after already gone. Found my way over to Pike Brewery and caught up with folks at the SQL Sentry party which was fantastic and continued to meet wonderful SQL people. Peer pressure was high to continue on after that but I held strong out of exhaustion and called it a night after that.